Promotional Items Under $2 | 8 affordable giveaways to market your company! Step up your marketing game with these 8 affordable promotional items under $2! Great giveaway ideas that won't break the bank! When it comes to marketing your company/business/event with promotional items, there are a few directions you can go. Appoach 1. - Order tons of "cheap" items. By "Cheap" of course I mean affordable. We understand that some times you just need boat loads of products for a giveaway. If you fall into this category I have some really great promotional items under $1 that we've covered in a previous post and some of these items may work too. Approach 2. - Order a few expensive VIP items. This is a great approach if you've targeted a small group of customers who you're are already doing business with or on the verge of becoming clients and just need a little push. When you need VIP promotions, we can help too! But what if you're not in either category? What if you're somewhere in the middle? At Leone Marketing we have promotional products for every budget and these 8 promotional items under $2 really shine if you're looking to step up from the sub $1 range, but not quite ready for premium giveaways. Below are my 8 favorite items in the $2 price range! Looking to hand out a nice pen at your next event or want to have a nice set of pens displayed at your front office. This is the pen for you! This multi-purpose 3-in-1 plastic ballpoint pen comes with a stylus and yellow highlighter tip. 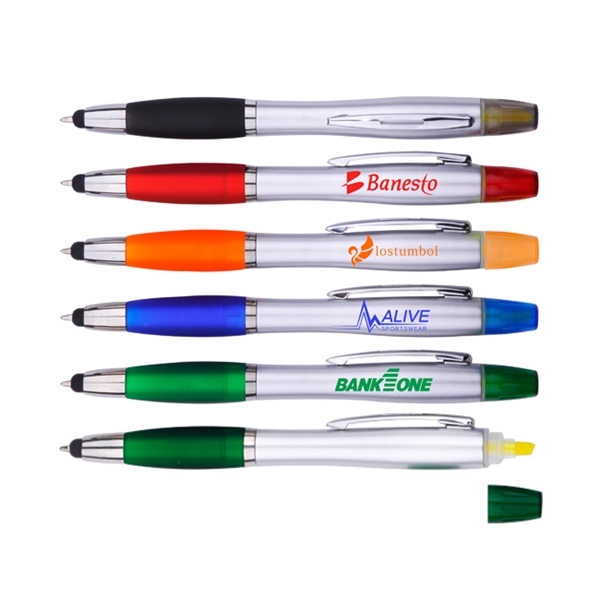 This pen has a silver barrel and matching grip, plus the highlighter cap comes in the color of your choosing. Disposable bags are even more popular these days as many towns and cities are banning plastic bags. Recyclable and reusable, this shopping tote is a great promotion for grocery stores, markets, book stores, tradeshows, and much more. Made of 80 gram non-woven, coated water-resistant polypropylene, this bag features reinforced 20" handles, a 10" gusset, and matching covered bottom insert. Sponsoring an eco-friendly event and looking for something inexpensive to promote your brand? Notebooks are useful for almost any event, recipient or occasion. This is made using using recycled paper covers and feature a colored matching spiral, 50 pages of lined paper and a matching recycled pen that writes in black ink. Keep your brand front and center! These cell phone/tablet stands are sought out by millennials and baby boomers alike! It even holds your device in a vertical or horizontal position and is a great choice for home or office. The oval cutout in the back of the stand allows cord access, for charging or synching, while the device is cradled in stand. Features an incredibly cool modern design! Shine the light on your next event with the fun flashlight branded with your company logo. Each features a twist on/off operation, krypton bulb, and wrist strap for added security in the dark. 2 AA batteries are included so this light is ready for immediate use. Perfect for outdoor or evening events. Who is isn’t stressed out in today’s day and age! Everyone can use one of these in their home and office. This stress reliever is perfect for trade shows, conventions, wellness campaigns and other promotional events. Have your company logo or custom design imprinted on the surface for maximum brand awareness. Order today and squeeze away all your worries with this handy stress ball! Every family and home needs multiple water bottles to stay hydrated so why not promote your brand at the same time! These 20 oz. custom plastic water bottles are made of high density polyethylene the flexi-grip easy squeeze-action bottles feature a ridged cap and an easy-flow drinking push spout. Available in tons of fun colors or un-imprinted. Architects, construction companies, builders, contractors and designers this is the promotional product for you to have on hand when promoting your brand. The tape measure includes a level, 5' metal tape with inch scale and a stop lock button. Offered in two different colors to choose from, have your company name or logo imprinted on the surface for great brand visibility.